I may never drink Pepsi again. Not because of its new, terrible, and—as of press time—pulled Kendall Jenner “resistance”-themed advertisement, but because it’s a trash soda that makes it feel like my teeth are about to fall out. Besides, co-opting the movements of the counter culture is an advertising tradition that, while extremely worthy of criticism, goes further back than Pepsi Clear. In the past decade, to present just a few examples, we’ve watched Dove (and half the beauty industry) use female empowerment and the body acceptance movement—primarily driven by online women’s media—to sell soap and shampoo, Cheerios put out ads that feature gay dads and interracial couples primarily to inspire think-pieces and generate free advertising, and Jay Z’s apparel company Rocawear try to profit off of the Occupy Wall Street movement by pushing out an “Occupy All Streets” t-shirt in the early days of 2011's occupation of Zuccotti Park in the financial district of Manhattan. 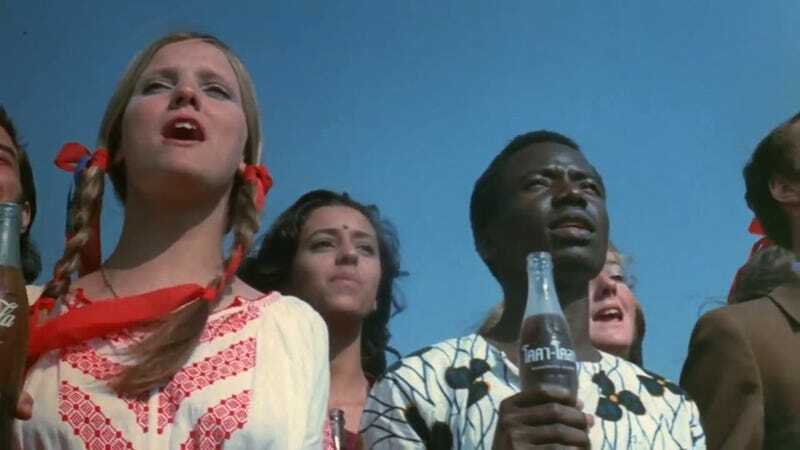 Perhaps the most famous “woke” advertisement of all time is Coca-Cola’s “Hilltop” ad, recently re-popularized in the series finale of Mad Men. Leaning heavily on the pro-peace, anti Vietnam hippie imagery of the era, this 1971 ad generated the hit song “I’d Like to Buy the World a Coke,” which was then adapted into another hit, “I’d Like to Teach the World to Sing (In Perfect Harmony).” Created by McCann Erickson’s Bill Backer, the idea originated when the ad man, frustrated and stranded at an airport in Shannon, Ireland, noticed a handful of his fellow passengers laughing over bottles of Coca-Cola. In that moment [I] saw a bottle of Coke in a whole new light … [I] began to see a bottle of Coca-Cola as more than a drink that refreshed a hundred million people a day in almost every corner of the globe. So [I] began to see the familiar words, ‘Let’s have a Coke,’ as more than an invitation to pause for refreshment. They were actually a subtle way of saying, ‘Let’s keep each other company for a little while.’ And [I] knew they were being said all over the world as [I] sat there in Ireland. So that was the basic idea: to see Coke not as it was originally designed to be — a liquid refresher — but as a tiny bit of commonality between all peoples, a universally liked formula that would help to keep them company for a few minutes. Among the most prolific political/social advertising campaigns are the ones produced by photographer Oliviero Toscani for United Colors of Benetton in the ‘80s and ‘90s. The ads, a part of the Italian retailer’s “United Colors” campaign, featured provocative images, some even featuring severely impoverished children and scenes from the deathbed of AIDS activist David Kirby. Somewhere in the happiest, most diverse city on the planet, a group of people are marching. What are they marching for? Who knows?! They’re carrying an array of vague, Pepsi-blue signs and they’re all very positive because this isn’t one of those rowdy, urban protests, ya know? Maybe they didn’t intend to make light of any serious issue, but—like Coke in the ‘70s—they did intend to make money off one. Did this ad fail where “Hilltop” succeeded because it’s a shittier campaign, or because we’ve all become more conscious consumers? Ideally, it’s a mix of both, though I guess we’ll find out the next time a corporation tries to sell an idea that has nothing to do with its product.